It's Christmas season, and where does someone find a gift for the person who has everything? Neiman-Marcus, of course! The Texas store is renowned for its expensive luxury gifts, and “his and hers” fantasy items. 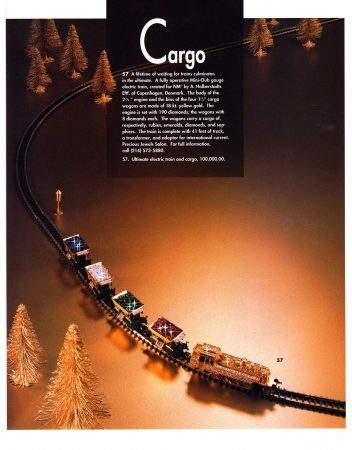 In 1992 one of those superlatives was this working model train made from 18 carat gold. Diamonds were encrusted into the engine. Cargo wagons were loaded with rubies, emeralds, sapphires and diamonds. Forty+ feet of track and transformer to control it complete the gift. One can only imagine what a stunning effect it would make when that train rolled out from under the tree on Christmas Day. Actually, you don't have to imagine, because a version of the train is still on view — in Denmark. The train's maker, Halberstadt Jewelers, has put one in their store windows for many years to bring smile to the face of young and old as they watch it sparkle and glisten. The jeweled train set could be yours ( from NM in 1992) for $100,000. I'll take one. Or perhaps two tickets to Denmark.